Today's Winter Hand & Skin Care Series features a brand that was "new to me" earlier this year, and it has become a favorite of mine. Shea Terra Organics offers a wide range of natural body care items that are reasonably priced. They often send out 30% off codes and other deals if you sign up for their newsletter. In fact, they have a 30% off code right now that's valid through December 22. Use code dec2011 (all lower case) at check out to receive the discount. Here's a tip: Their mini Whipped Shea Butter Cremes make great stocking stuffers, and with the discount they're only $4.20. With enticing scents like Gingered Pumpkin and Bourbon Vanilla, I'm tempted to get some of these to stuff my own stocking with! 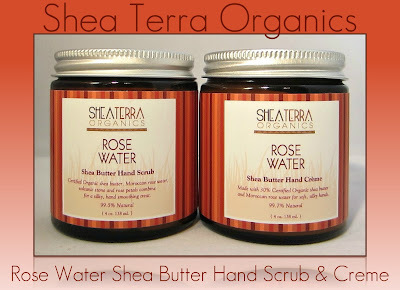 Shea Terra will be sending one of my lucky followers a set of their Rose Water Shea Butter Hand Scrub & Hand Creme! The hand scrub contains volcanic stone to gently exfoliate your hands, along with rose water and shea butter to soften and protect them. I scoop out a small amount, then massage into my hands and cuticles using small circular motions. I then follow up with the hand creme, which also contains rose water and shea butter for rich moisturizing protection. The scrub doesn't seem to have much of a scent, and the creme has a very delicate rose scent. Your hands will be smooth and soft after using these products, and the scrub is gentle enough to use daily. They also do a fantastic job of softening other trouble spots, so you'll want to use these on your feet, knees and elbows as well, during the cold, dry winter. These products are packaged in 4 oz. glass jars and retail for $18.00 each. Shea Terra Organics, utilizing healing African oils, botanicals and butters for nearly a decade, has made a name for itself by giving back to Africa. All products are made of raw materials purchased through free trade practices, which guarantees that fair prices and wages are paid to African workers. Shea Terra products are made with only natural, organic ingredients, without sulfates, parabens, artificial fragrances or colors, and are cruelty free. Please read below, as I am implementing a new way to enter! Entry Details: One follower will receive a set of Shea Terra Rose Water Shea Butter Hand Scrub & Hand Creme. This is only open to residents of the U.S., as fulfillment for the prize will be handled directly from Shea Terra. Contest begins 12/7/11 and ends 12/12/11 at 12:01 a.m. I should mention that I've never used Rafflecopter to host a giveaway (or a "Sweepstakes", as the FCC will soon refer to blog giveaways as!). In an effort to comply with these FCC standards, protect your privacy, and hopefully make giveaways...err, Sweepstakes a little easier to manage on my end, I'll attempt to utilize Rafflecopter from now on. I'm also working on wording for official contest rules, also in a compliance effort, and as soon as that has been finalized, I'll post them under my Contact/PR tab. The Rules policy won't have any direct effect on my contests or on you as entrants, but it's all about trying to keep up with FCC-implemented recommendations for bloggers and staying legal. Wait for the Rafflecopter to load (click "read more" located under the Pin It icon if necessary), enter your information by leaving a comment that you'd like to be entered (you can follow Body & Soul on Facebook for an additional optional entry--new followers and current followers can take this option), and the winner will be announced on Monday in my my Come Monday weekly newsletter on December 12, 2011. *Products featured and prize provided by Shea Terra Organics. i would really love to try some products with rose water. even though i'm in hawaii, and therefore don't have the extreme weather of many of your followers, my hands are in need of some moisture therapy. 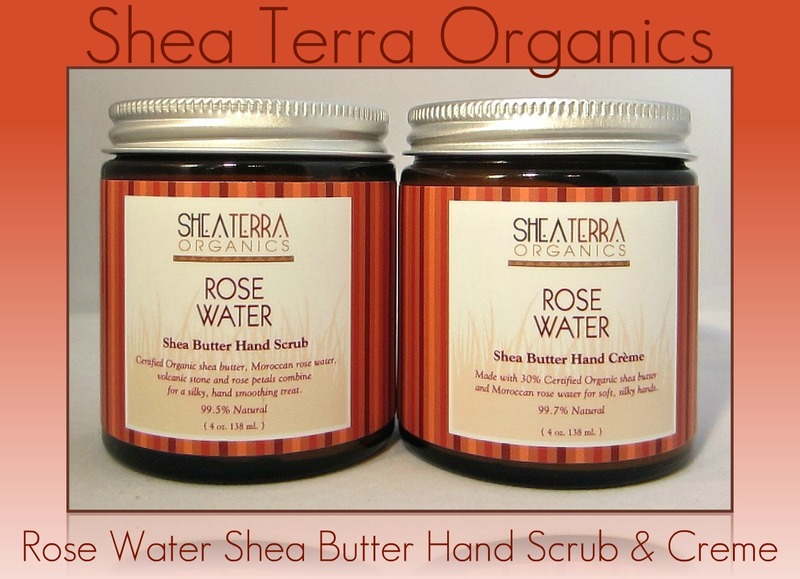 I haven't tried Shea Terra and would love the chance to try the rose water hand cream. my hands could use a little extra TLC. I have heard lots of great things about this product. Thanks for the opportunity! These are products I definitely need. Thanks. I really like the fair trade aspect of Shea Terra! Thanks for the chance to win some really cool products! I hope whoever wins this set enjoys it to the fullest! I love scrubs! perfect give away for winter. Yeah! I'd love to try these products!! Wow these look really nice for my dry hands. I've never tried a hand scrub before. This time of year my hands need all the help they can get. i've been reading a lot about this brand and i would love to try it! This is perfect for winter, thank you very much! I love their company! I got a sample of the gingered pumpkin....OMG amazing! And the rose soap--while not the prettiest scent in the world--works very well. I've never tried their products, but I would like to try the rose water hand lotion. Sounds heavenly! My hands are a mess in the winter. I would LOVE this! This sounds like a wonderful product! Crossing my fingers!